Sam Pagano worked hard to succeed at Youngstown College as a football player and after leaving the school he kept that strong work ethic starting his own businesses, becoming a successful teacher, creating his own patents, being a sincere family man and serving as an officer in the military. Pagano was a lineman for the Penguins from 1952 through 1954. The Penguins had two of their most successful seasons in their first 40 years during his last two campaigns on the field. In 1953, the Penguins were 7-1 and followed that in 1954 with a 7-2 mark. 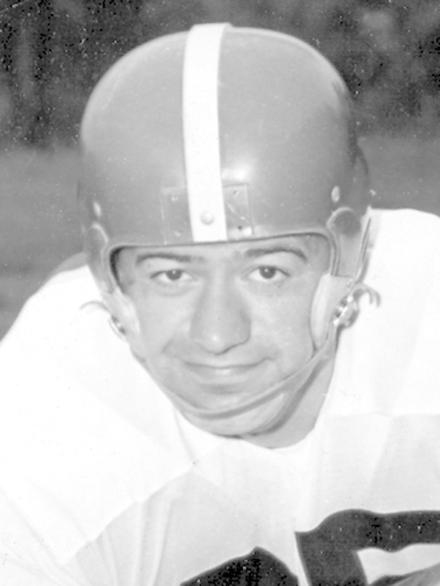 During the 1954 campaign, Pagano led the team as a team captain. He earned the game ball for his performance in an upset victory over Great Lakes. Great Lakes featured two future professional players, but Youngstown proved to be too much in a 34-32 triumph. Off the field his senior year, he was the President of the "Varsity Y" Club and was the R.O.T.C. Battery Commander on campus. He graduated from YSU in 1955 with a degree in Merchandising and Marketing. Later he earned his Masters from Kent State University in 1967. While attending YSU, Pagano and his brother started their first business, Pagano Cleaners. The venture, which he started with his brother Guy, lasted 12 years. From 1955 through 1957 he served a two-year tenure in the United States Army. In Mainz, Germany, Pagano was a First Lieutenant and Platoon Leader. Upon returning to the Mahoning Valley, he began a long and enjoyable career as an Industrial Arts Teacher. He spent two years as a teacher in the Johnston School District before spending 29 years teaching Industrial Arts at Howland High School. After closing Pagano Cleaners, he and his brother Guy and brother Andrew Petrella opened Hubbard Funland. The Funland park was open for 22 years before closing in 1985. Pagano continued to keep adding to his activities by becoming the President of Type-Rite Enterprises, Inc. There he earned the first four of his nine patents by inventing copy holders. After serving as the top person in the company for 31 years, he moved to Director of Sales for Type-Rite from 1997 through 2000. After a brief stint as the President of Pagano Enterprises, he became the President of Love to Learn, Inc. There he invented and patented a big book holder. He is currently the President of Hold 'N View Enterprises and Girard Development Enterprises. For the company he has invented and patented four copyholders. A current Penguin Club member, he was a graduate of Girard High School. There he was the senior class president and was a starter on the football squad his last two years. He remained true to his school serving as the chairman during the Girard High Football Stadium restoration project in the mid 1980's. He worked to revamp the Girard High Band Shell and was a member of the Girard Board of Education. Sam and his wife Dahlia live in Girard. Dahila taught in the Youngstown City School System for 34 years. They have three children Trina, Lia and Paul.